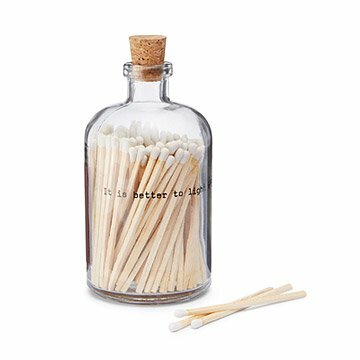 Push the human/fire relationship forward with this lovely, yet practical, apothecary match bottle. Nobody knows when humans learned to control fire. A million years ago? Two? Yet we still haven't achieved control over the matches in the junk drawer. Push the human/fire relationship forward with this lovely, yet practical, apothecary match bottle. The design features the inspiring phrase "It's better to light a candle than to curse the darkness" and a subtle striking flint on the side of the bottle, which elevates this candle companion out from under stray paper clips and ancient phone chargers and onto the mantel. Matches made in India; all other components and packaging made in the USA. Includes 120 four-inch matches. I absolutely love these matches. They are the perfect decor addition to my bathroom. I needed a place to keep matches and a strong striker. This fit the bill! I don't love the fact that it has the quote but it's pretty subtle. Bought 2. One for my sister and one for myself! It's the perfect gift to complement the candle I got her for her birthday. We put it in our bathroom near some candles we light frequently and it is a beautiful decor piece and functional too. The poetry is beautiful and I love the typewriter style font on the piece. Very attractive design for many rooms in the house. Great item, love the look of it on a shelf. The matches are cool and usable too. I use this item in the kitchen, next to the stove.